Outdoor living rooms have become a highly sought outdoor living backyard addition for homeowners who want to relax outside in a comfortable environment. From entertaining family and friends on the weekends to enjoying a glass of wine after a long work day, an outdoor living room can offer you a space to recharge while enjoying the beauty of nature. Residents of Bucks County, PA, and all other nearby communities who want to add outdoor rooms to their homes can turn to the experts at J. Marrazzo Custom Homes. When homeowners in Yardley, Newtown, New Hope and beyond choose us to help create outdoor living rooms at their homes, they work with one of our highly experienced designs. The designers will help ensure that each homeowner’s outdoor space meets their needs and complements existing elements, such as a pool, patio, or other features. Next, our own full-time, expert installers – never subcontractors – will install a patio, deck, pergola, outdoor kitchen, or any other outdoor feature to help define the living space and provide visual interest to a backyard. There are many approaches to creating your outdoor living space. 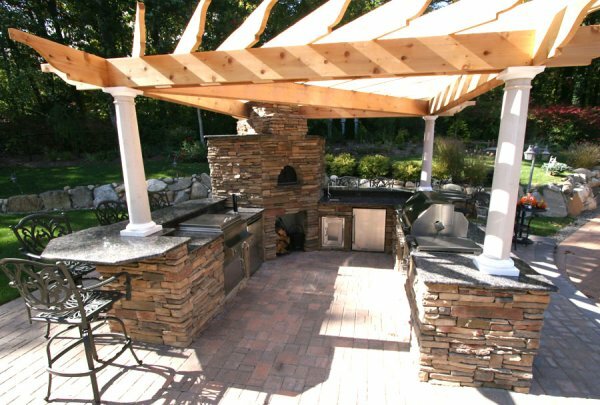 Whether you are looking for a basic deck or a custom deck with flagstone patio, fire pit and outdoor kitchen, we can help you design what you need. The professionals at J. Marrazzo Custom Homes, can help our customers in Bucks County make your home the showpiece it deserves to be.